A plan is made of each room. No ceiling shape is too complex, there can be an unlimited number of corners, curved sides and levels. 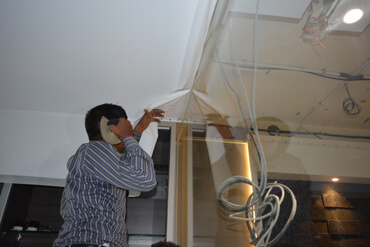 The measurements are taken and sent to the nearest Nakshatra Clipso® production site. 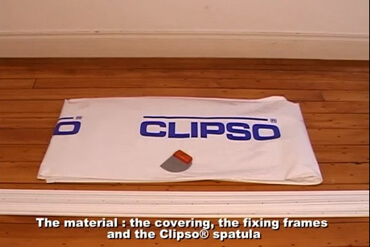 Every stretch ceiling is made to measure: cut-outs and joins are accurate to the millimeter. The lead-time can be shortened on request and under certain conditions. 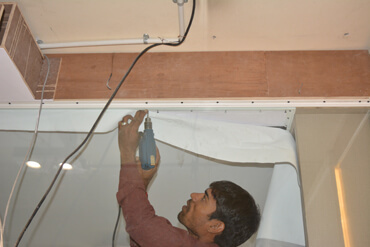 The peripheral rails are mechanically fastened to the wall or ceiling (screws and plugs, staples). Generally there is no need to move furniture out of the room to install a stretch ceiling. Prior to installation, the professional takes care of the necessary requirements and other important details necessary for the perfect fit. 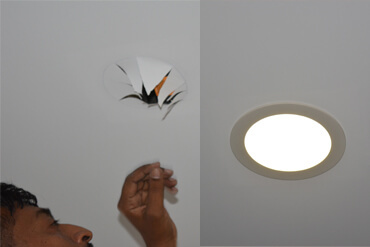 Subsequently, you will always be able to add a light or an alarm system or an extra cable behind the ceiling. 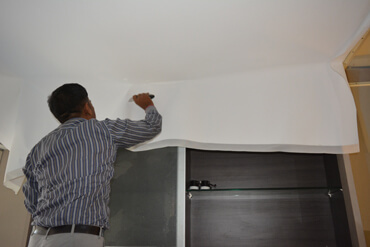 The Nakshatra Clipso® stretch ceiling can be taken down and put back very easily by your approved dealer.